The alliance of Renault-Nissan for global platforms was a long, hard road of engineering collaboration and development for a dramatically different product development process, but the payoff is big savings and faster drawing board to showroom times. One of the biggest model unveils for the 2014 model year from Nissan is the high-selling Rogue. The 2014 Nissan Rogue crossover has been completely redesigned and is a global platform for the company, being sold in various markets under different names. It's also the first vehicle fully designed under the Renault-Nissan alliance shared platform agreement - which they call the Common Module Family (CMF). 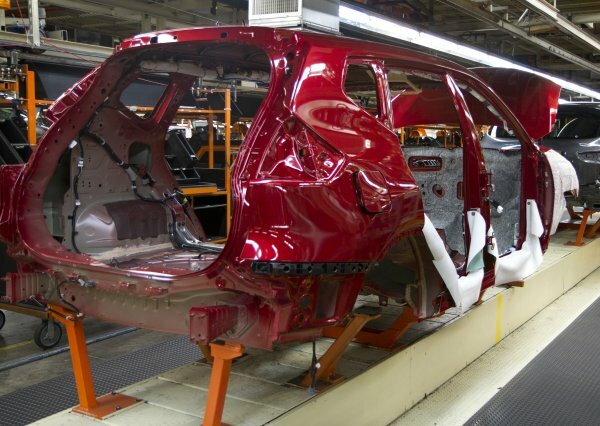 The 2014 Rogue is part of a new, modular development strategy being employed by the two companies and required engineers to overcome some huge challenges. Some of those challenges were political, some were physical, and some were legal. The political aspects included agreements on which parts to standardize across the board, which suppliers in each region to source those parts from, and how to commonize the parts being used and how they operate. For an example of the latter problem, Nissan's Toshiyuki Takahashi, deputy general manaer of strategic planning, talks about the six months of negotiations with Renault that went into just the headlamp control switch set on the steering column. Most of us, as drivers, would consider this no big deal. You twist something to turn them on, move the stick up or down for turning, and maybe pull it back or push it forward to activate the high beams. Right? Not so fast. Nissan's standard has been to cycle off-auto-parking lights-on and push-pull for high beams. Renault, however, uses lights-on-auto and no push to activate high-beams (only a pull). Seems like a small difference until you consider that brand loyal customers are used to the way things work now and changing them can have big implications for user friendliness with future buyers. Six months of negotiations later, said Takahashi, and they'd settled on a compromise using Renault's light cycle and Nissan's high beam controls. That was one of 83 separate components on the Rogue that had to be made common between the two brands. All of that effort, though, has a payoff. A big one. Purchasing costs will be cut by 20 to 30 percent and engineering costs by 30 to 40 percent. This gives a wider range of vehicles from a smaller box of parts, allowing for lower costs across the model lineup for both manufacturers. Legal challenges for the engineers to overcome involved making common components that meet the standards and requirements of various jurisdictions globally. Often, automakers will make separate versions of the same vehicle for various markets, changing some components in order to meet legal requirements in one region while dropping components because they are not required in another. The goal here is to eliminate most of that change in favor of one common solution that meets or exceeds all requirements. This is cheaper in the long run thanks to improved economies of scale. The Nissan-Renault CMF strategy will have its first fully-commonized vehicles hitting the market in 2016 with several interim partially-common vehicles like the 2014 Rogue in the mean time. The plan is for "kits" to make up three basic vehicle segments: A-class subcompacts, B-class small vehicles, and C/D-class midsize and large vehicles (sedans, crossovers, etc). From this parts kit, designers can create unique vehicles while utilizing common parts for the simpler things and improvements made can be rolled out within a generation on all vehicles involved. The idea of common modules is not exclusive to Nissan, of course. Volkswagen pioneered the concept by combining forces within its constituent sub-brands like with the VW Golf / Audi A3 combinations. Toyota and Peugeot are doing the same while similar work in the new Chrysler-Fiat combination is now happening as well. For Nissan, the Rogue is the flagship for the idea and will be followed by the X-Trail and Qashqai crossovers. Renault will use it in the Espace minivan and then roll it out to eleven other nameplates in the next two years. A-segment vehicles in the CMF concept will appear in 2015 with B-segment vehicles likely coming a year later, though no timetable has been set. Four assembly plants are being tooled for the CMF system now (Smyrna, Tennessee in the U.S. and plants in Japan, China, and England). By 2016, 11 more will be added to that, including Nissan's plants in Mississippi and Mexico. This will be roughly half of Nissan's global production base. For automakers, the push to streamline this way is huge. Market pressure is requiring higher-cost technologies in vehicles whose price points are not rising to match. This modular development process and the savings from economies of scale it brings are a way to counteract the higher-cost, lower-return vehicle market of today.